Recently, there has been a disproportionate amount of mock outrage cast in the media (social or otherwise) about hunting for sport. We purposely choose the word ‘mock’ because one man, kills one animal and all of sudden we as a society now have the moral authority to judge this man for his actions, all the while ignoring the unpleasantries of dealing with our own lack of morals when it comes to the humane treatment of our fellow man. But, I am digressing very wildly, so in the interest of brevity (and to avoid further opening of this can of worms) suffice it to say that: 1) I do not support hunting for sport, 2) Mob justice is an oxymoron, and 3) What do we do to quench mankind’s thirst for the hunt and the trophies thereof? 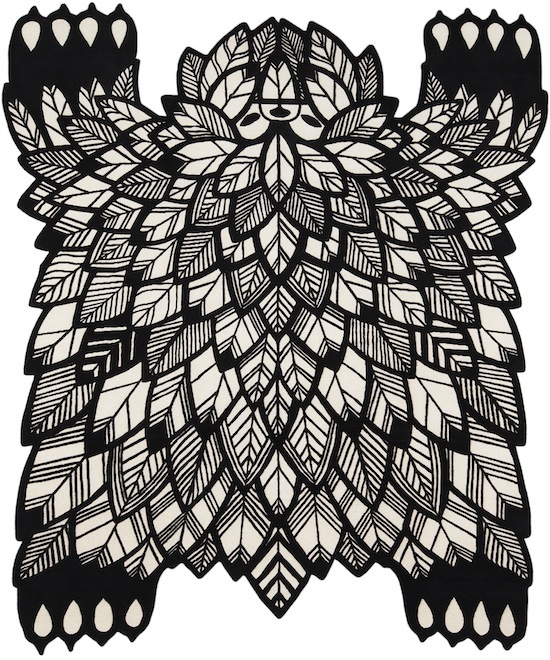 In answer to that question I propose we give them a placebo of sorts, one that reinforces our machismo as the alpha predator on this planet, one that says unequivocally while thumping our chests that ‘We are the masters of this place!’, we give them: Fabulous handmade rugs in the shape of stylized animals! Seriously? Yes, seriously. Think about it for just a moment. Mankind has been hunting, both merely to survive and for sport, for millennia. It, coupled with our intelligence (as a whole), is what has propelled us from wherever we began to our current state of technological prowess. Why not proclaim our mastery by using our intellect instead of our might. People who thought fire to be magical and women to be demon possessed witches could hunt but they could not conceive of, design, make, ship around the world, market over the internet, and discuss on a rug and carpet media website in the comfort of your home, car, train, aeroplane, in pyjamas or in a suit, objects that exist solely to be pleasing to the eye (and foot). They could not, but we, we in this time and place can. So we shall, and we do, but that want – perhaps as primal instinct manifest – for the hunt still remains. I surmise this is why we – the more talk about rug types – still have a penchant for animal skin designs. A kind of homage to our past if you will. 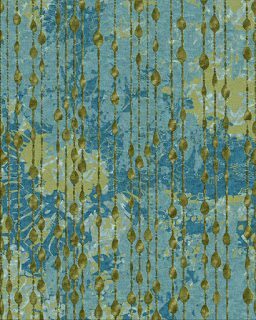 With that, we come to the absolutely fantastic carpets from Chevalier édition designed by French artist SupaKitch. Born in Paris in 1978, SupaKitch was raised in the era of hip-hop culture. Influenced by Japanese Manga, he has been passionate about art and music since his childhood creating a universe filled with Asian, pop-romantic, and musical influences. For about a decade now, he has worked on the subject of animals and of a personal graphic representation of their textures (feathers, fur, et cetera). Over this time the Supanimal became a recurring character in his work, looking like a red panda, a fox, and a bird. Used as metaphors, they have become his signature. His long standing appreciation for animal skins on the ground (see the correlation now? 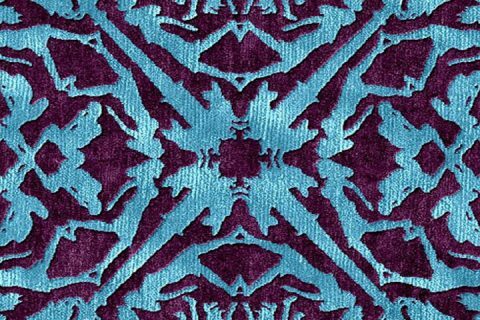 ), without ever having had the opportunity to own one, led him to create the SupaFlat and SupaCut rugs for Chevalier édition. Now we expect that many of you will have already seen the SupaFlat rug (as shown above), as it graces the cover of the current Summer 2015 issue of COVER Magazine. We say expect because as a contemporary rug and carpet aficionado you should be reading that fine publication. You should also be reading Rug Insider (What’s he getting at? 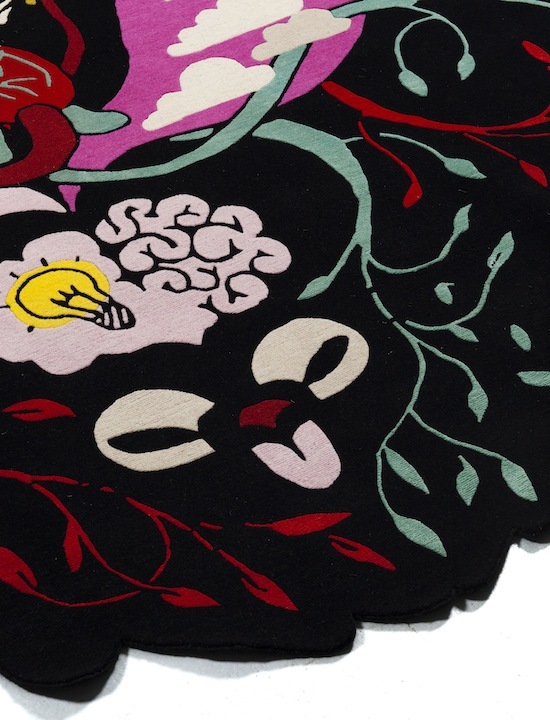 ), Rug News and Design (Hmmmm), and as should be more than apparent: The Ruggist (Duh!). Regardless of what any one of those publications (The Ruggist included) tells you, we all offer differing perspectives on the rug industry, and in order to form your own well educated opinion, you must consume them all! But where were we? Oh yes! So what does The Ruggist offer you in this case that COVER did not? Perhaps we offer you a whimsical look inside SupaFlat (pun intended) by presenting its companion carpet: SupaCut. Talk about primal instinct manifest! 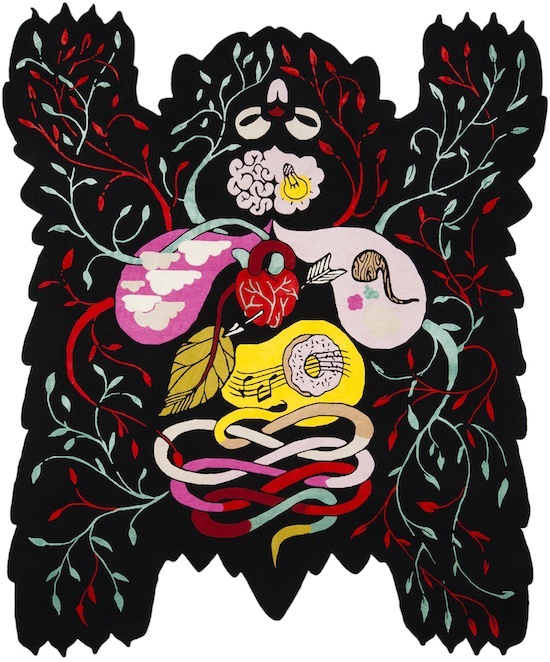 It is literally a carpet made to look like a gutted animal, replete with all manner of internal organs and symbolism taken from our modern world. Veins and arteries colour coded in blue in red alluding to the erroneous belief that oxygenated blood is red and oxygen depleted blood is blue. A heart struck through by an arrow, was it for love – as the tattoo artist often depicts, or was it for the lust of the kill? What thought immortalized by the lightbulb did SupaCut last have? Perhaps it was to have another musical doughnut, while having a puff on that wonderfully cartoonish smoke emitting wooden pipe. Perhaps the smoke, depicted as red and blue clouds, implies some sort of intoxicant now coursing its way through SupaCut’s body. What manner of meals consumed over the past several days prior to her demise (untimely or otherwise), gave such varied colour to her intestinal track? We would like to imagine it as some other fanciful and tasty delight – something that Willy Wonka would conjure up – that satiates both the physical appetite and any one or more of the five (5) senses. However you interpret it she must have enjoyed that last meal, just look how content those eyes are. I say she as the face appears feminine to me, but perhaps not to you. Regardless, what thoughts do you have of this rug? Last night I imagined this rug in my dining room, making guests quite uncomfortable as they eat dinner. Certainly it would spur conversation such as I’ve mentioned, but how do you think guests would react if asked to ponder: ‘How does it feel having your feet rubbing around the inside of this magnificent creature?’ I ask this overtly probing and agitating question for the want of more intellectual discussion of contemporary rugs, and because I’m slightly uncouth (as is the world) and the ensuing discourse would be brilliant. SupaKitch, as the guest of honour would say as he has: ‘I always loved animal skin on the floor but, for various reasons, I’ve never bought one. This might have created some sort of frustration that pushed me to create as soon as possible my own animal skin. It really was fun.’ The other guests would nod in tacit agreement, until a voice reminiscent of Violet, Dowager Countess of Grantham (Downton Abbey reference) elocutes: ‘Oh it is gross, unsophisticated, and in poor taste!’ We don’t agree with that fictionalized statement about this rug, but we do agree that it aptly applies to hunting trophy animals solely for sport.